You might know already that split means ‘to divide into separate portions’ or ‘to separate.’ It can also mean ‘to share,’ if you divide something between different people in a group. As a slang term, to split means ‘to leave.’ As a noun, a split is a crack or, in US English, a piece of wood separated by splitting. 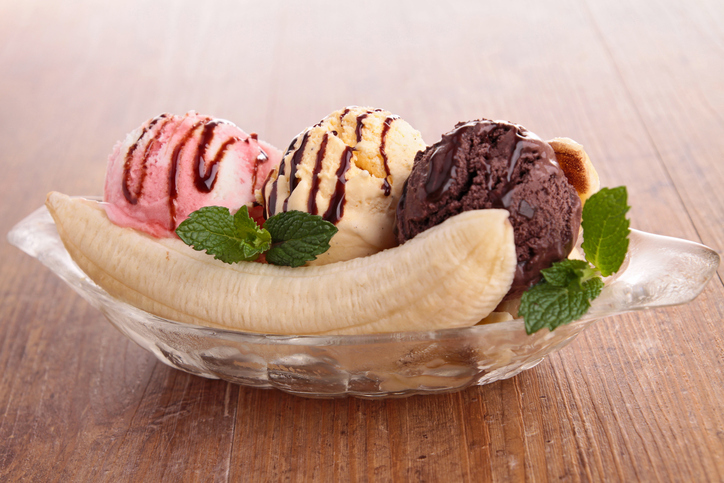 Split is also a dessert, an ice-cream dish made with a split banana, ice cream, flavored syrup, and chopped nuts (in the UK, this is only used in the combined form “banana split”). As an adjective, split refers to something divided or parted. Tania split the chocolate bar in two. The path split and we had to decide whether to go left or right. Sabina and Veronica split the bill. John was here earlier, but he had to split. There is a split in the wood near the bottom of the door. Oliver picked up a split of wood. Diana ordered a banana split. Tim ended up with a split lip after falling off his bike. Split, as a verb, dates back to the late 16th century. Its origin is Germanic, but since no examples have been found in Old or Middle English, linguists believe that it came into English from a Low Germanic language, such as the Dutch splitten. It can be traced back to the Proto-Germanic spl(e)it- and the Proto-Indo-European root (s)plei– (to split or splice). It is related to the Danish and Frisian splitte, the Old Frisian splita and the German spleißen (all meaning ‘to split’), as well as the Greek plinthos (brick or tile), the Old Irish slind (brick), and the English noun flint. The colloquial sense ‘to separate’ (referring to couples), and the US slang sense ‘to leave’ both date back to the mid-20th century. The expression ‘to split hairs‘ is from the late 17th century, while ‘to split the difference’ dates back to the early 18th century. ‘To split the ticket or the vote’ has been used in the US since the mid-19th century. The noun, meaning ‘a narrow cleft or crack,’ dates back to the late 16th century, and comes from the verb. The sense ‘a piece of wood split off a larger piece’ dates back to the early 17th century, while ‘a separation’ was first used in the early 18th century. The gymnastic movement has been called a split (or the splits) since the mid-19th century. Finally, the adjective dates back to the mid-17th century, and comes from the verb.